Looking towards the cathedral from the Old Town Hall tower. 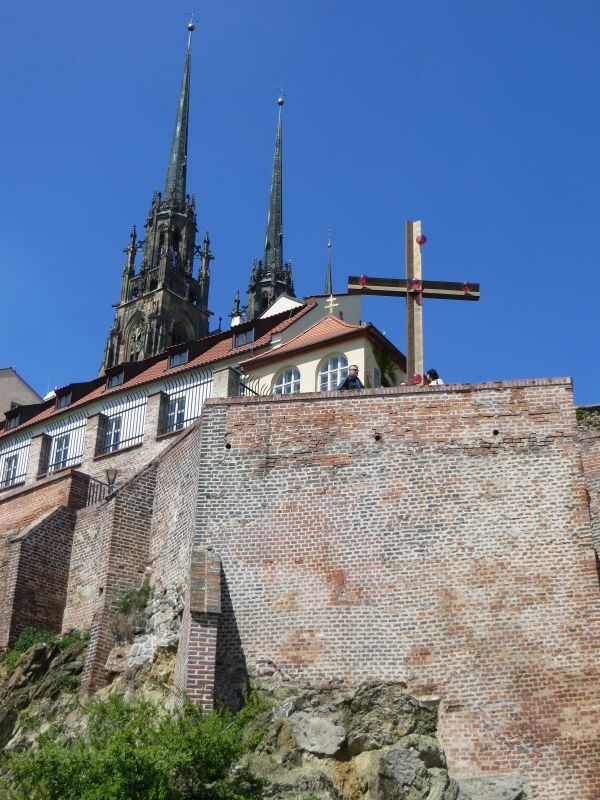 Sitting atop Petrov hill, the highest point in the centre of Brno, this cathedral will most likely be the first thing to catch the attention of any visitor to the city. It can be seen from many approaches to the city, some from further away than others. From a historical standpoint, the cathedral has great importance; so much so that it is a national heritage site and its image can be seen on the 10 Crown coin. What is now a cathedral started as a simple church which, by the late 12th century, needed to be enlarged in order to house an increasingly large congregation. 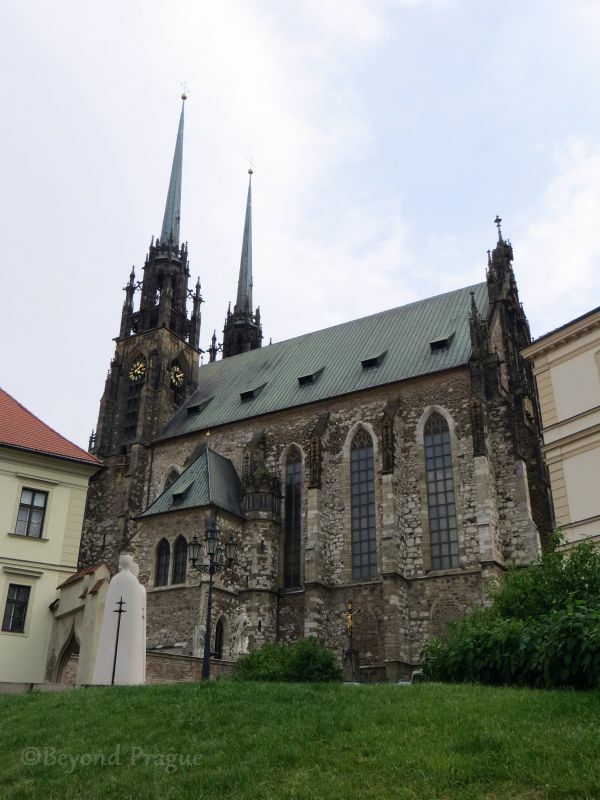 It was officially declared a cathedral in 1777, when a bishopric was established in Brno. Over the centuries, the building has seen several repairs and alterations made as well as taking serious damage during the 30 Years War. The last major reconstruction occurred in the early 20th century and resulted in the current arrangement of a Neo-Gothic exterior and largely Baroque interior; it was also this reconstruction that gave the cathedral its signature spires. The cathedral spires from a lower point on Petrov hill. Traditionally, the cathedral bells are set to ring noon at 11:00. This tradition dates back to the 30 Years War when, according to legend, the Swedish army laid siege to the city and nearby Špilberk fortress. As the story goes, the commander of the Swedish forces agreed to call off the attack if they could not successfully conquer the fortress by midday on August 15, 1643; thanks to quick thinking and a bit of shrewdness, someone decided to ring noon an hour early that day. The Swedes kept their word and Brno was saved. So, if you hear the bells chime noon but you see 11:00 on your watch; don’t panic! You haven’t lost an hour and your timepiece is perfectly fine. If you happen to be visiting Brno in mid-August, you might be lucky enough to see a reenactment of the battle to mark the anniversary of the day and the city keeping it’s freedom. The view to the cathedral from Biskupská street in the city centre. Getting a good general photo of the cathedral requires getting a bit of distance from it as it’s very tightly surrounded on all sides by other buildings. Two good places for such a picture are from Špilberk hill or the small park at the foot of Petrov hill, where Hybešova and Nádražní streets meet. It is possible to go up inside the spires, though a bit of stair climbing is involved. 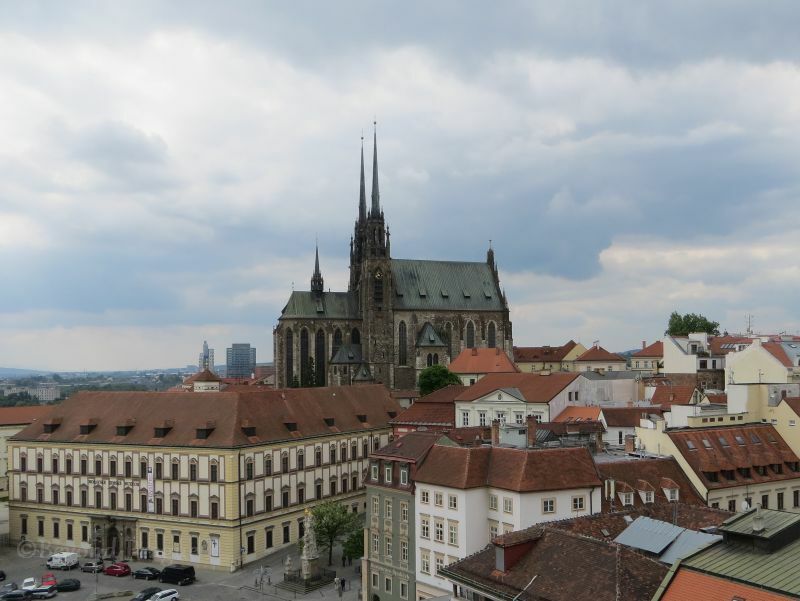 Both spires have small lookout points, one overlooking the city centre and the other overlooking more residential and commercial areas of the city. One spire also houses a small museum exhibiting ceremonial clothes and other possessions of the Brno bishopric through the years. It is possible to enter the main part of the cathedral, but respect should be exercised as it is an active place of worship. If you wish to take a rest between the cathedral and your next stop in Brno, Denisovy Sady is a small park on the side of Petrov hill with plenty of benches to sit down and take a rest on. It also makes a very nice place to watch the sunset from at the end of a long day.